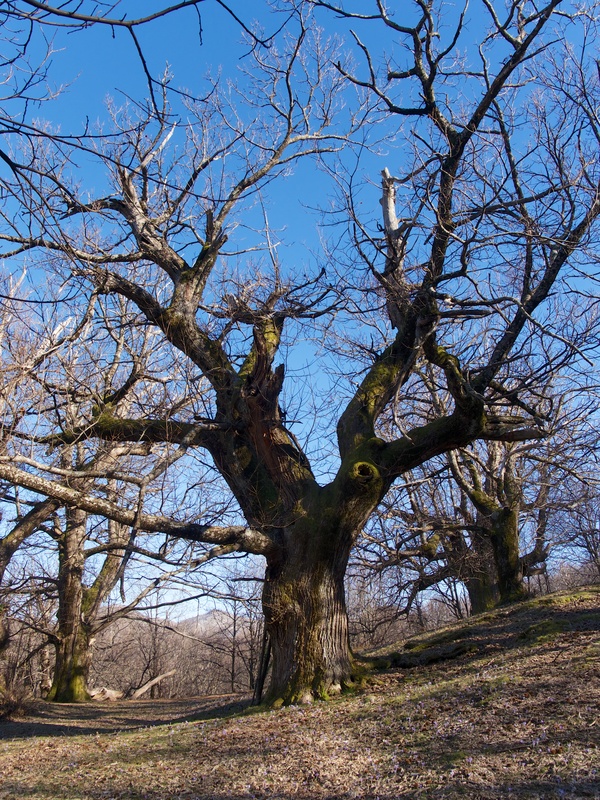 Soon after the narrow road from Virpazar to Ostros passes the turn for the small village of Livari, the scraggy oak-hornbeam gives way to a woodland of huge, sweet chestnut (Castanea sativa) trees that straddles the road. These are ancient, venerable trees with thick, deeply riven trunks and decaying crowns. On walking around, some seem to be in laid out in straight lines and regularly spaced; they look like an ancient plantation. They were and are an important food source and perhaps they were planted for that purpose? 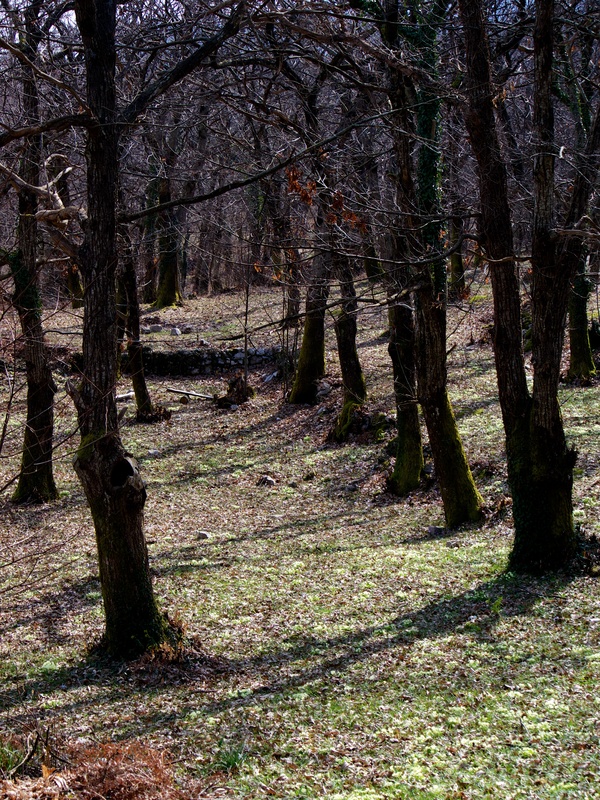 Further on, near Koštanjica, there is another chestnut woodland but younger than the Livari wood, yet still old, and this too appears to have been planted in straight lines and on old terraces. 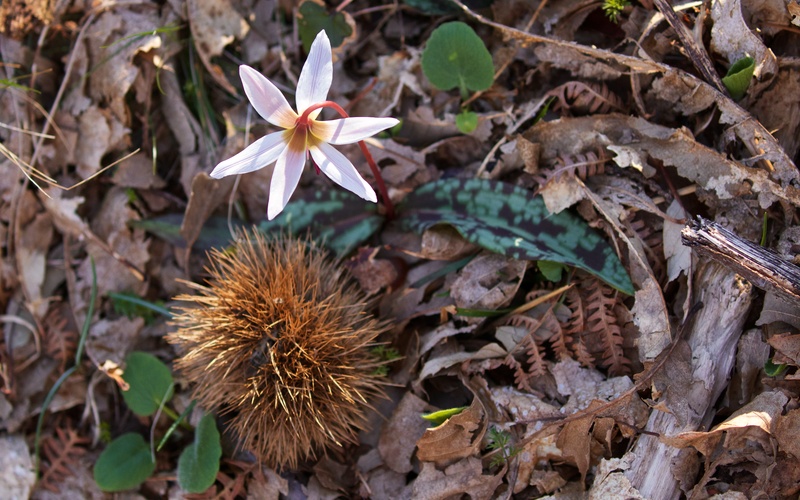 I checked the literature and found a paper on the timing of flowering and fruiting times (phenology) and also the yield of nuts; it stated that these are natural woodlands but I am not so sure. I need a long tape measure. There is also a paper on bugs and beetles, with rare species recorded in the dead and decaying wood of the vast limbs; this rotted commodity is an overlooked seam of gold in this utilitarian and efficient age, added to which these specialised insects are not that mobile. There is also another that lists 60 species of lichens. The old, wrinkled and broken trees support many interesting species, most of which I shall never identify. Sweet chestnut woodland on the edge of Rumija near Livari. Huge veteran trees at Livari. Some of the trees at Livari marching down the slope in regular formation. 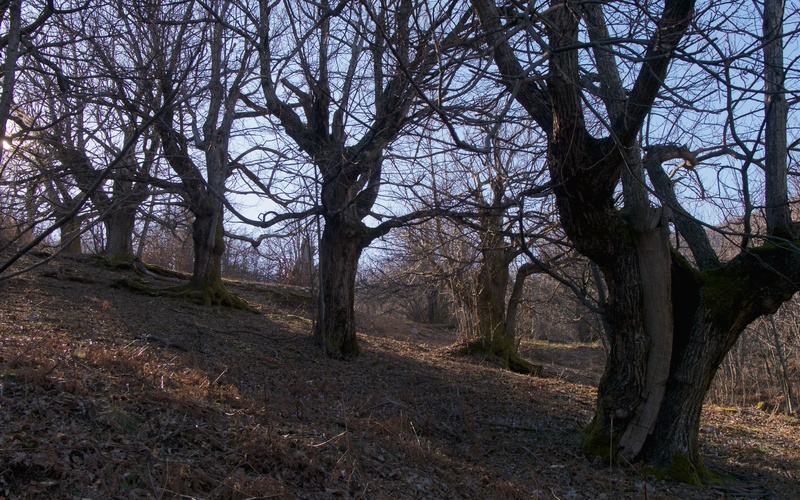 The ‘younger’ Koštanjica woodland silent in their ranks. Both these woods have no shrub layer but a potentially rich and interesting ground flora including some thin stands of bracken (Pteridium aquilinum), carpets of primrose (Primula vulgaris) and a smattering of crocus, sweet violet (Viola odorata), dog’s tooth violet and, I think, green hellebore (Helleborus odorata) but the Balkans, of course, hold a range of species so I need to look again. This is no hardship; these woodlands on the gentle slopes of the mountain are an easy and most pleasurable place to explore. The woodlands were full of bird sound; nuthatches calling, jays laughing and wheezing, and a strange, strangled call from a green woodpecker. 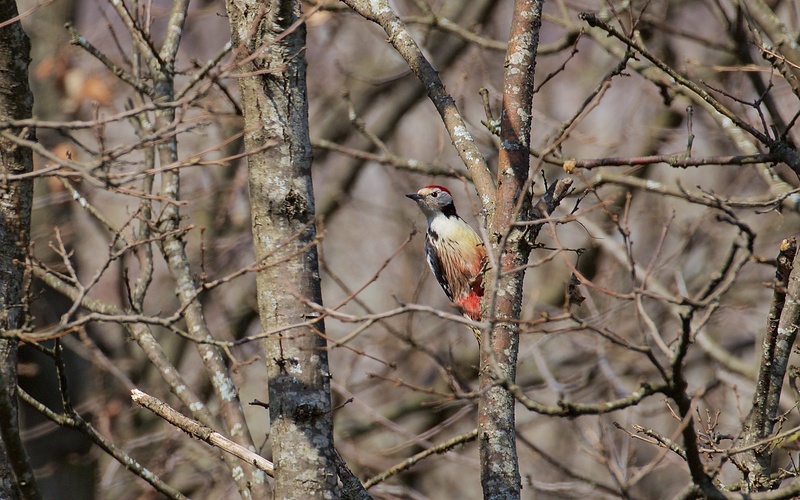 Which, on tracking it down, turned out to be a middle spotted woodpecker shouting its territory. 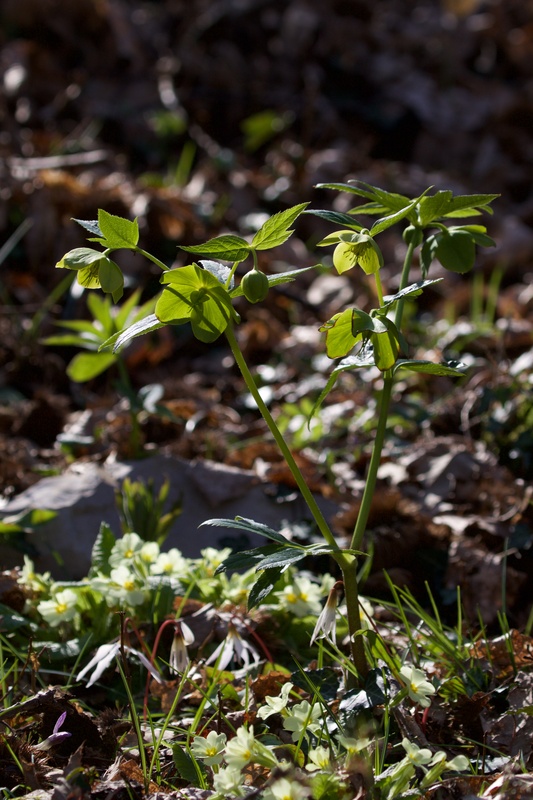 These prefer old forests and these chestnut woodlands are probably an important local habitat for them. Middle spotted woodpecker on a slender oak. I also thought I heard a tawny owl hooting. The old and decaying tress have so many holes and crevices offering nest and roost sites for owls, kestrels and also bats. I sense the silent trees hold many surprises but, whatever is recorded, tallied, compared and assessed, there is no doubting that these BFGs are priceless works of Montenegrin art.